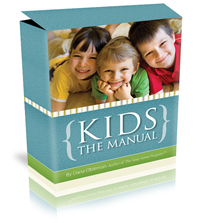 “Kids: The Manual” is backed by a 12-month, 100% ‘No Questions Asked’ Money-Back guarantee. After following the methods in Kids: The Manual, our girls need very little asking to keep their room tidy. “My husband and I were at the ends of our ropes. My 4 1/2-year-old son is very strong-willed. There were constant power struggles in our house. We have begun using the methods presented in Kids: The Manual, and we are starting to see some positive results. He has been much more cooperative because I stay calm and patient, and he can see that I'm listening to him.